Community Police Liaison Committee CPLC 51 Division: French domestic violence conference, "It’s Everybody’s Business. Speak Up!" French domestic violence conference, "It’s Everybody’s Business. Speak Up!" Media advisory, Saturday, March 11, 2017, 8 a.m. - 4 p.m., Toronto Police College, 70 Birmngham Street, French domestic violence conference, "It’s Everybody’s Business. Speak Up!" 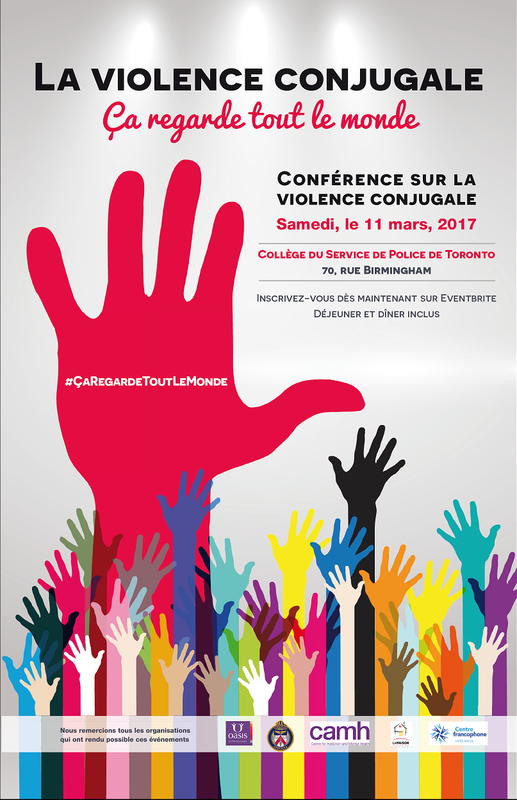 The Toronto Police Service will be hosting a French domestic violence conference called "It's Everybody’s Business. Speak Up!" The conference will take place on Saturday, March 11, 2017, at the Toronto Police College, 70 Birmngham Street, from 8 a.m. to 4 p.m. The conference is free to the public with breakfast and lunch included. Anyone wishing to attend the conference must click here. The following organizations will be presenting: the Toronto Police Service, Children’s Aid Society, the Crown Attorney’s office, Victim Witness Assistance Program, Elder Abuse Ontario, Centre Francophone, CAMH, and Oasis Centre des femmes.